Life is better with sprinkles! Or is it ice cream is better with sprinkles? 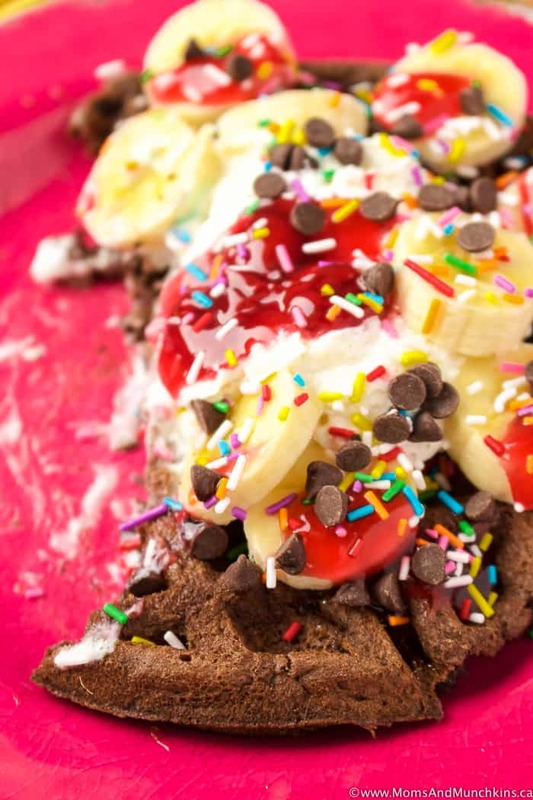 Meh, either way let’s talk about these Banana Split Waffles loaded with extra sprinkles. I suppose you could call this a breakfast food since waffles do technically fall into the “breakfast” category, but you’ll probably want to classify this one as a dessert. 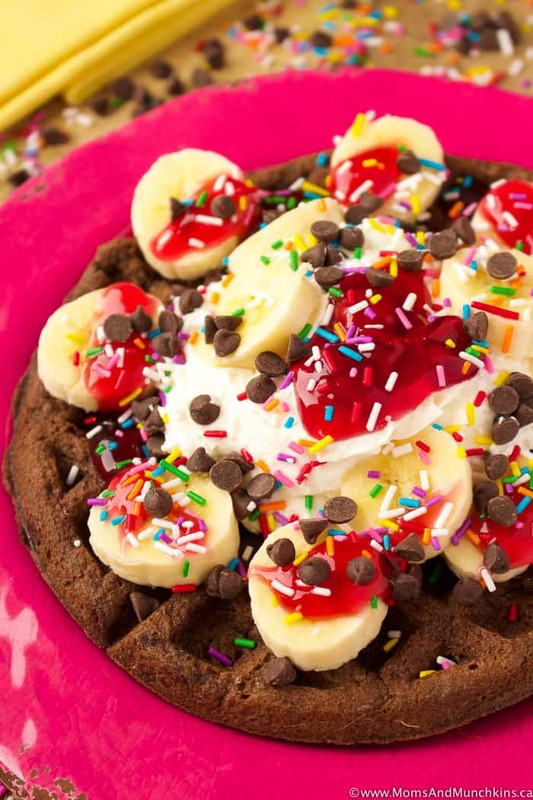 Chocolate waffles, bananas, whipped cream, cherry pie filling, chocolate chips and sprinkles = yum! This would be a great dessert idea for a slumber party set up in a buffet style so guests can top their own waffles. You could add vanilla ice cream and chocolate fudge sauce to the buffet for options too. Oh great…now my tummy is growling again. These waffles couldn’t be easier to make because they start with a boxed cake mix. Super easy! 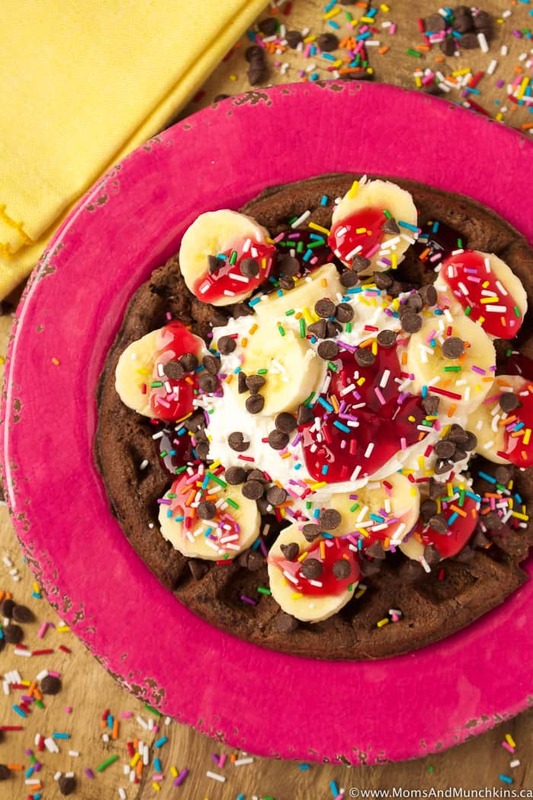 Feel free to add in some extra chocolate chips (about 1 cup) to the cake batter for extra chocolatey waffles. For extra chocolatey waffles, add in 1 cup of chocolate chips to the batter. This recipe makes 10 large waffles. Preheat waffle maker to a medium heat setting. In a large bowl, combine cake mix, water, vegetable oil and eggs. Beat on medium speed for two minutes. Spray waffle maker with non-stick cooking spray before cooking each waffle. Pour batter into the waffle maker. The amount of batter depends on the size of your waffle maker. You'll want enough to cover the waffle grill but not so much that it will overflow when you're cooking it. Depending on the size of your waffle maker, you'll get between 8-10 waffles from this batter. Carefully remove each waffle from the waffle maker as they are done. Top each with desired toppings. 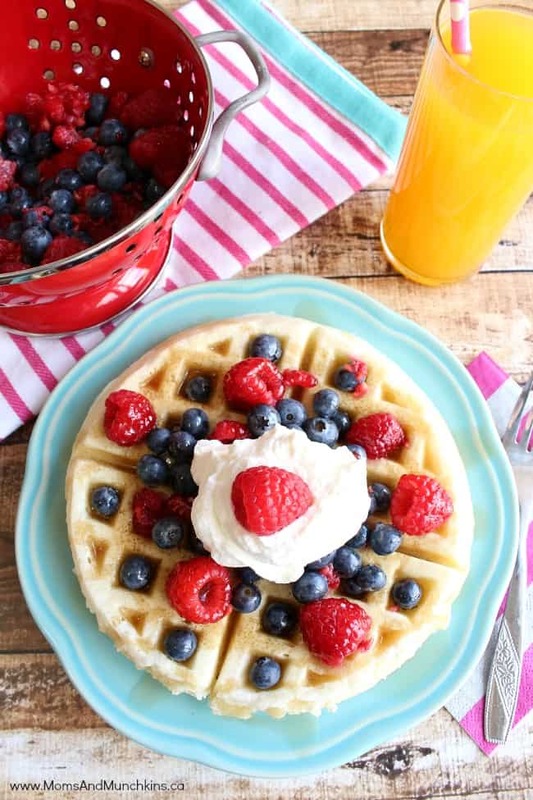 Looking for homemade waffles instead of from a boxed cake mix? Here is a recipe for the best homemade waffles! You can make this batter the night before and leave it in your fridge overnight. For more delicious recipes, visit our Recipes page. Stay updated on the latest recipes and party ideas by following us on Facebook, Instagram, Pinterest and Twitter.